Most people search the web for used cars. If your car isn't listed in a used car classifieds site in addition to newspapers, you could have a tough time selling your car. Eliminate the buyer's #1 reason for not buying your car! There are various books (NADA Guides, Kelley Blue Book, etc.) that will list the value of your car based on condition, mileage and geographic area. But I think that the best way to determine "market value" is to look at the final selling price on various car selling websites like eBay Motors and Yahoo! Autos. FACT: You get more for your car selling it yourself instead of trading it in to a car dealer. If it's less than 4 years old, dealers give you at least $3,000 less than market value for it. If your car is over 4 years old, dealers give you only 25% of fair market value! If a dealer offers market value for your trade-in, they are making up for it on the back side of the deal in the form of full retail price, wasted dealer extras or bad APRs. Anyone who thinks a dealer is really giving them market value for their trade in is living a pipe dream. In our finance section, we talk about the importance of checking your credit report to make sure there are no mistakes. If there are, you have to get them fixed before you apply for a loan, because false information will cost you in higher interest rates or prevent approval. Vehicle history reports are like a credit report on your car. Any bad marks will give a buyer something to seize upon to negotiate the price down. Some items are so bad that it will turn a buyer off completely. The records that appear in the reports were all entered by humans at some point, and everybody makes mistakes from time to time. Maybe you brought your car in for service with 122,000 miles on it and the service advisor can't read his own handwriting and enters it as 172,000 miles. Now, you go to sell your car which has 130,000 miles on it and a buyer shows you a report that indicated 172,000 miles a year ago. Of course, it appears that the odometer has been rolled back. This scenario actually happened to one of the editors of CarBuyingTips.com (who will remain unnamed to prevent embarrassment). The lesson learned from this experience is that you must get a vehicle history report before putting your car up for sale. If you find any erroneous records, you will have to contact whoever entered the information and get them to rectify the error with the vehicle history report providers if at all possible. Be prepared before the first buyer shows up. Make printouts from several car pricing sites showing the market price of your car. Do not print out trade-in values. If the buyer complains about every scratch, mark stain, on your car, tell them it's normal wear and tear for a car of that age and mileage. Every used car has scratches from road debris. If they give you a sob story that they have no money, ask them why they came if they had much less money than your firm asking price. Now you have them on the defensive. Your car is still worth market value no matter what money the buyer has. This is why I recommend that in your ads, you mention that the price is firm. 4. Eliminate the buyer's #1 reason for not buying your car! You should put the buyer's mind at ease by giving them a copy of an AutoCheck Report on your car that they can take home. It will show that your mileage has not been rolled back, your car has never been flooded or junked or in a wreck. Buyers are always wondering 3 things: What's the mileage? Was the odometer rolled back? Was the car ever in a wreck or junked before? Eliminate these fears and you eliminate their #1 excuse for not buying. You never know who is looking where for used cars, so give yourself the best odds and blitz all the main online used car classifieds. I'm a believer in blitzing the media. Place your classified ad on multiple sites for maximum exposure. Here's our reviews of the major players. 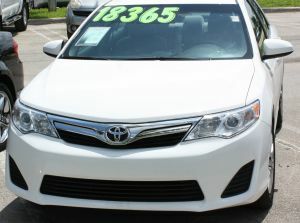 CarsDirect.com will help you sell your car fast by showing your ad to millions of car buyers every month. It's easy. Enter your car info, upload a photo. Pay for the ad online with your credit card. You can edit or extend your ad any time for no extra charge. Cars.com reaches 10 million online used car shoppers each month. Your online only ad with photo appears on Cars.com, and over 175 affiliated websites. Premium and Enhanced ads can be renewed for free until you sell your car. CarBuyingTips.com has uncovered a new scam that is being pulled on people selling cars online. Scammers are feigning interest in your and respond to the craigslist ad with a request to buy a specific vehicle history report. They send you to a professional looking website and they steal your credit card number. Get all the details on this fraud and how to avoid it, read our exclusive report: Fake used car buyers, trick sellers into running VIN# reports to prove car is OK.
Read our fraud article before buying or selling a used car. There are scammers roaming the Internet looking on eBay, AutoTrader, and just about any classifieds site, no matter how big or small has been hit. If you know anyone about to list their car online for sale or buy a used car from any online site, forward this to them. Don't agree to escrow of any kind without reading our fraud article! We saved one visitor from a $28,000 rip-off when the seller asked him to use an escrow site that we determined was fraudulent. When you are done with this section, read the article: Guide To Check Fraud, Escrow Internet Fraud, Auto Fraud and Nigerian Scams. If you owe money to a lender on your car, the lender appears on the title as a lien holder and they are holding the title. When you pay off the loan, they mark the title as lien satisfied and send you the title. If you owe more than the car sells for you'll have to pay the difference since you're upside down on the loan. If don't have enough to make up the difference you can't sell the car. The world is not beating a path to your car so you have to beat a path to the world. Don't do just the usual one week $35 newspaper ad to sell it. Very few people sell their car using a one week newspaper ad. Your budget will get you into 3 different classified ad venues like a newspaper for about $35 for a 1-2 week run, and at least 2 popular classified ad web sites, usually $20 for a 30 day run. Auto classifieds on the web are much more cost effective than newspapers as they are cheaper and run 4 times as long. Why limit your ad to 5 local people who might want your car, when you can put it on the web where there are millions of people doing searches.Use online classified sites where your ad stays until the car sells. Don't park your car on a road to sell it, it can get vandalized, ticketed and towed. You'll get more than any dealer will offer. Dealers scare you out of selling it yourself saying you'll get sued by the buyer, or you'll get robbed or raped (very popular to use on the girls). Sure there's risk, but I'm more scared at the ATM. You'll have problems like no shows, so be patient. Some people are not comfortable with strangers at their house, knowing their phone number. But millions of people list their phone number in papers all the time. I just don't think it's as bad as the dealers claim. This useful Excel spreadsheet form is actually 2 forms in one. The first is a Used Car Bill Of Sale, which takes the guesswork out of trying to figure out what information you need when transferring title of a car from the seller to the buyer. The second form is a Deposit Slip, similar to the Bill Of Sale. The deposit slip is used as a written confirmation between the buyer and the seller itemizing the selling price of the car, the buyer's initial deposit and how much the buyer still owes on the used car. 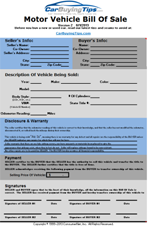 Click here to download our Bill of Sale form. Put a good wax job on the car, vacuum the inside and gloss up the tires. Appearance is everything. If there's any lights out or fuses blown, take care of it. Buyers get picky once they see little things. Consider adding a few accessories to the car to make it even more attractive like a steering wheel lock or other perks. A powerful selling tool is a neat notebook with all your maintenance records, especially oil changes. Every time your car is serviced, add the receipt to the notebook, you'll never lose track. When people see your notebook with maintenance records it makes a good impression, and they're more likely to buy from you. I would not try to sell a car without an AutoCheck Report. Create a flyer about your car to give to potential buyers. If you were the only owner and non-smoking then make it known. People like one owner vehicles, it's easier to trace what might have happened to it and non-smokers also make for an attractive car. My wife drove me crazy every time I let a buyer walk, but you must be strong. Why should you give up $1,000 in market value just because someone you don't even know claims your car is not worth it? Ask the buyer where they got their figure from, and what research it was based on, they'll have no answer. They'll say, "other people are selling it for less." So ask them "why didn't you buy the other guy's car?" You are using the car pricing sites with used car blue book values so you have done proper research and know what your car is worth. After reading this article, if you would rather trade you car in click here to read our article about the Trade-In process. It's the worst thing a seller can do and a lot of people do it. It makes you look desperate. Say "Firm" or "Non-Negotiable." You'll still get plenty of leads, I always do, and never had a problem.